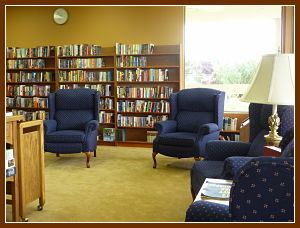 The purpose of the Library Committee is to work consistently to keep the library in good order and accessible to all Summerfield residents; to maintain the shelves in an orderly manner according to the assigned categories and in the areas of fiction, non-fiction, westerns, and mysteries shelved by author. Biographies are shelved by subject. The library also has large print books (both fiction and non-fiction), CD’s, DVD’s, books on tape, magazines, cookbooks, puzzles, as well as books on hobbies, true crime and travel. The committee consists of 8 volunteers plus the chairperson. Each of the volunteers works one week (7 days) out of 8 under the leadership of the chairperson. There are no terms of service, volunteers work as long as they are able. The chairperson assigns the calendar for the volunteers and helps the volunteers as needed. The chairperson is responsible for maintaining the library new editions and arranging for recycling out-dated and worn books. The volunteers shelve new donations and returned items according to category making sure all have a Summerfield ID and date of arrival.